processor, the producer will complete an approved bill of lading form outlining producer name, date of shipment, ear tag #, age, estimated live weight, and breed. 2.) Ownership Transfer Form: Producers must keep a signed ownership transfer form on hand for at least one year following live sale to the WGBC. Members may be subject to third party certification or inspection. Calves must not be weaned prior to 120 days of age. Producers are encouraged to wean later, up to 10 months of age. Access to mother’s milk during winter contributes to higher weight gains of market animals and does not harm the dam. Pasture forages can include perennial grasses (cool or warm season grasses), legumes (alfalfa, clovers, etc. ), and broadleaf forages (chicory, naturally occurring ‘weeds’ in pastures). Grazed forages may include summer and winter annuals such as brassicas, vegetative small grains, sorghum, and grazing corn. Seed must not be developed when grazed. Annuals must be grown without synthetic herbicides or pesticides. Any of the above perennial or annual forages may be fed as stored hay, haylage, or silage. Non-grain based mineral and vitamin blocks or granular products. Flax seed or flax seed meal, grown without synthetic pesticides or herbicides. Grains and oilseeds (with the exception of flax). Corn field aftermath grazing (too much grain remains in the field). Implants, hormones for growth promotion. 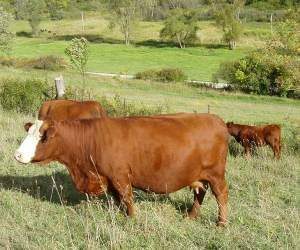 Access to/intake of fresh pasture requirement: a minimum of 30% of total annual dry matter intake from pasture and a minimum of 150 days on pasture. Grazing will be managed to optimize the health and productivity of the land and the animals. Management intensive rotational grazing is strongly encouraged. No feedlot confinement production is allowed. 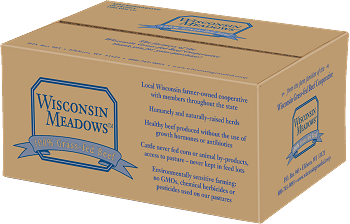 No synthetic herbicides or pesticides are allowed on pasture or harvest forages. If ultrasound inspection is conducted, finished animals should have at least 0.2 inches of back fat and an ultrasound tenderness score of 2.5 or less. No antibiotic or growth hormone use is allowed for slaughter animals sold through the WGBCs grass-fed beef program. Organic and natural veterinary treatments are allowed including live or partial viruses. Appropriate veterinary treatments, which may include antibiotics, is required to ensure humane treatment of all animals. However those animals cannot be sold the WGBC. All veterinary treatments must be documented for each animal and records must be available for inspection by the WGBC. Synthetic chemical wormers and fly treatment are allowed if the withholding period of 90 days before slaughter. Small to moderate framed animals are highly recommended (Frame scores 3-5, steers finishing at 1000 to 1200 pounds). Smaller framed animals finish on pasture more easily and will provide consistent sized cuts for our customers. Possible breeds include British breeds such as Devon, Murray Gray, Galloway, and British White Park and may include smaller framed strains of Angus and Hereford. Humane handling procedures will be used throughout the life of the animal. Both the producer and the processor will use humane handling procedures that foster calmness during loading, trucking, and slaughter. Producers are encouraged to educate themselves and practice good stockmanship through the teaching of Bud Williams, Steve Coty, Temple Grandin or others. Members are encouraged to monitor weight gain and achieve a goal of at least 1.5 pounds per day throughout the slaughter animal’s lifetime. Animals >30 months of age will be paid cull cow price unless inspector determines they are finished in accordance of our marketing program. Slaughter animals may be subject to visual inspection for finish by a WGBC member or employee. 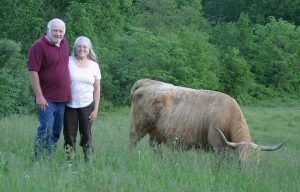 The WGBC reserves the right to refuse entry of an animal into the grass-fed marketing program if it is not appropriately finished. Members will certify with a WGBC shipping affidavit that they have followed this protocols. The WGBC may engage in a peer inspection program through which members will monitor each other for compliance with our standards. The WGBC may institute a third party inspection process. Should an animal be condemned please see the WGBC transfer of ownership/condemnation procedure.